The City of London Distillery & cocktail bar opened in 2012 bringing gin making back to the City after an absence of nearly 200 years. Using handmade artisan techniques, we produce a growing selection of award-winning small-batch connoisseur’s gins; No.1, City of London Dry Gin, No. 2, Christopher Wren Gin, No. 3, City of London Old Tom Gin, No.4, City of London Sloe Gin & No. 5, Square Mile London Dry Gin. 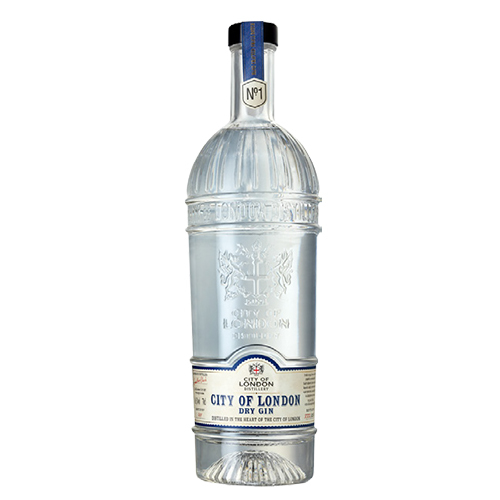 City of London Dry Gin is a one-shot connoisseurs’ London Dry Gin, flavoured with a fine balance of juniper berries, angelica, liquorice and coriander seeds – with fresh orange, lemon and pink grapefruit added also to give the gin its distinctive zesty notes. Aroma: Pungent, piney juniper aroma with zesty pink grapefruit, orange and lemon - also subtle notes of celery, sage and parma violet. Taste: Clean and characterful - a classic London dry gin with attractive parma violet, orris root, liquorice, zesty citrus and enlivening black pepper sauce. Aftertaste: Piney juniper, citrus and subtle peppery spice linger on the palette after tasting. Serving Suggestion: Serve with tonic water, lots of ice and a wedge of fresh pink grapefruit.